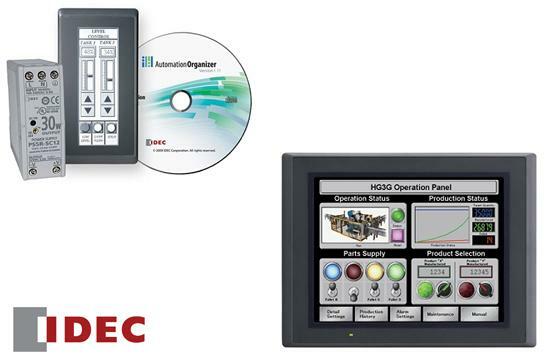 From 4.3” to 12.1”, IDEC has the right Operator Interface (HMI) for your application at the best value on the market. The 65,536-color High Performance Series provides realistic images and the brightest, sharpest display in the market even in low light environments. IDEC 8.4"/10.4"/12.1" touchscreens are on sale now! If your requirements call for a compact alternative to pushbuttons and pilot lights, look no further than IDEC’s low cost compact HG1F Series operator interfaces. These industrial monitors feature a 4.6” high resolution super bright LCD screen with landscape or portrait mounting. All IDEC operator interfaces program with the same user friendly drag and drop software and support most major PLC protocols. Control Components is pleased to offer you the full line of IDEC operator interfaces. If you have any questions contact us or click the link below for more information on all operator interfaces IDEC offers.